Replacement:LCD-11677. The new version of this module is now available. This page is for reference only. The uLCD-32PT(GFX) is a compact and cost effective all in one ‘SMART” display module using the latest state of the art Active Matrix LCD (TFT) technology with an embedded PICASO-GFX2 graphics controller that delivers ‘stand-alone’ functionality to any project. Note: The module can be switched to a "SGC" by changing the firmware. Also, It's been brought to our attention that trying to program the 4D screens using an FTDI breakout can damage the driver. You'll need to use the FT232RQ USB to Serial which you can find in the related items below. 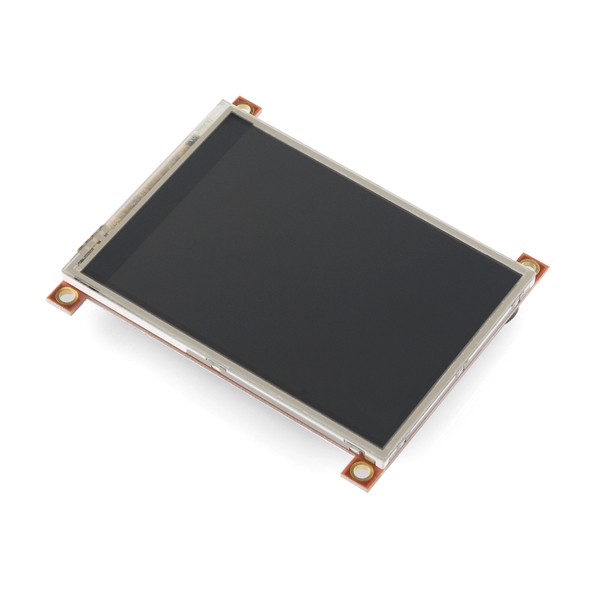 4D Systems has released a 4.3" TFT LCD Display solution that has similar features to the uLCD-32PT(GFX). Any idea when it gonna be in stock? I am having some trouble connecting to the expansion pins. I am fairly new at boarding and would like ask, is it better to program the 4d system as a store and display with minor controls and use an external mcu as a host OR make an expansion board for this. If anyone out there knows where i can find jumper wires that fit into the 0.05" all the better. I have a router with 10 GPIO lines... can I drive this? I want to display the configuration panel on it, as well as console output. Please checkout our Arduino LCD shield that supports 4DSystems modules directly as well as our open source library making it literally plug and play! Supports SPI(default), UART, and I2C communication modes. This screen is awesome: all-in-one at a low price! In the data sheet it needs a minimum of 4volts to 5volt tolerant pin, Will this display work with the Beaglebone since all the GPIO pins are 3.3v? I use this board with my PIC24 3.3v GPIO. TX and RX work just fine. 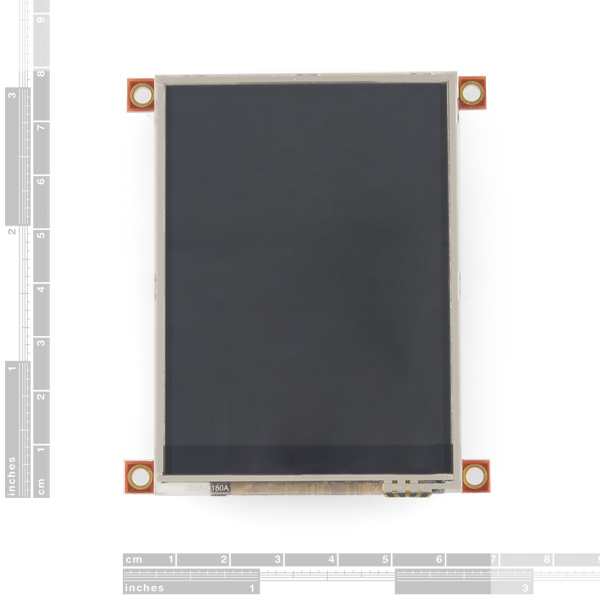 This is a great LCD touch screen, but are there any bigger ones out there? I haven't been able to find any. Love it! When is Sparkfun going to carry it? Shipping from down under is alot. Please modify your comment to use the "name (at) domain (dot) com" format. This will make it harder for bots to steal your email address. The tabbed mounting holes on these make them work great with the makerbeam. We plan on using the same concept on the upcoming Pygmy Web Board. Any estimates as to when these are going to be back in stock??? I you saying running the display at 9600 with a host or by itself? I have used the display at 115200 baud when interfaced to my micro controller. Also, if you are using the FAT controller, just changing the baud rate shouldn't be a problem. SFE, please carry the companion P1-EB, or have an interface board of your own for sale. I've just purchased this module from you, and I'm a bit frustrated. 4d Systems is out of stock on the P1-EB, and I don't want to re-invent the wheel. Unless you are running this in SGC mode, I can't imagine not needing the P1-EB. Since you are selling it set up for GFX, I'm surprised you don't already offer the P1-EB or an equivalent part. I too was looking for the P1-EB. 4d systems is out of stock too. 4d systems online do have the connectors and sell them in pairs. Mine are in the mail and I am waiting. I could not find an equivalent from digikey,mouser ? anybody have better luck finding equivalents for the connector?? the digikey connectors are here for the through hole, so far these may very well be the biggest PIA on a circuit I'm doing. What do you use to program this? These displays are quirky with a capital P.
Displaying any images or videos involves running them through 4D's proprietary Graphics Composer program (Windows Only). Unfortunately, it seems to be the best option available if you want to keep your pin count low. Adafruit's got a similar thing, but it's only 2.8" and it requires 4x as many pins. Anybody know how readable this TFT LCD display is in bright sunlight? I'd like to use it in an automotive application. It's not very readable in direct sunlight. The OLED version that 4Dsystems makes is much brighter but they are smaller and more expensive. Does anyone know if there is any way to control the backlight on this? Ideally to control brightness, but even on/off would be better than nothing. I've looked over the literature and didn't see a way either programmatically or by external control via an input. Can I programm the LCD with a standar serial COM port? What connector I need to access IO pins? Hey guys, I've been using the brother to this display, ( the amoled 32028) and needed to put it into a small box, so the P1-ED board (breakout board) was too big. I found these connectors on Digikeys's site that work. SAM8243-ND for the thru hole, and SAM8244-ND for the SMT. You can make your own breakout board using these sockets. Thank you, thank you, thank you! I had looked for these connectors at DigiKey under the SamTec designation of SFC-115, with no luck. Digikey's shipping cost beats SamTec's any day. It would be great if SparkFun carried the connectors also, considering they already carry the SamTec connector for the Lassen IQ GPS receiver. I haven't bought one but I'm planning to. I'm just curious how they're programmed - they don't have a USB slot and I haven't found a programmer listed on 4D's site. I am a huge fan of these displays. I have both a 1.44 and a 28PT. Both LCD. I purchased them directly from 4D in Australia. I am about to purchase a 24PT as well as it fits my final project better. I have not been able to use my touch screen yet as mine was cracked. It is currently in route to be replaced. I have programmed mostly using 4DGL. An interesting point that is missing both here and over at the 4D forums, those 30 Pin connectors are not necessary depending on what you are doing. If you are simply driving the display serially you can use the exposed J3 connector which has the Tx and Rx pins available. You really only need the extra pin outs if you need more inputs or outputs to the display driver. If you are already using a Processor use its inputs and outputs instead. I am actually using mine as 4DGL with a PIC16F88 to handle some other issues for me like ADC. I am also using the RF12B Transceivers and I found using the PIC to be easier than trying to use the Display even though I have not tried that portion of my PIC program yet. I want the display to focus on displaying and let the PIC handle the work. MechG, who commented below, has a very nice device he linked to from the 4D forums. You should check it out to see what these things can do. Now if SFE would only carry the other sizes! Freight from Australia is both expensive and time consuming. Will SFE be carrying the expansion board for this? Trivial, but are the dedicated home, mail, contacts, phone, and audio icons on this model as they are in the datasheet and on the companies website? Or is this a variant? Hard to tell from the images above. Thanks in advance. BTW, don't use Fedex Express Saver: From Boulder to Denver to Oakland to Phoenix; why not just Denver to Phoenix and save 1300 extra miles? Can I take this as a sign that my new baby is not faulty? I also wanted to ask if it was possible to communicate via the rxtx pins of the arduino without having to deal with any 4DGL. Yes, all you have to do is load the latest SGC-pmmc file into the display. The display is shipped with the GFX-pmmc i think because mines was just like this. Go to the www.4dsystems.com.au and download the pmmc loader and the SGC pmmc file as well. Afterwards, you will be able to send serial commands to the display using any microcontroller. 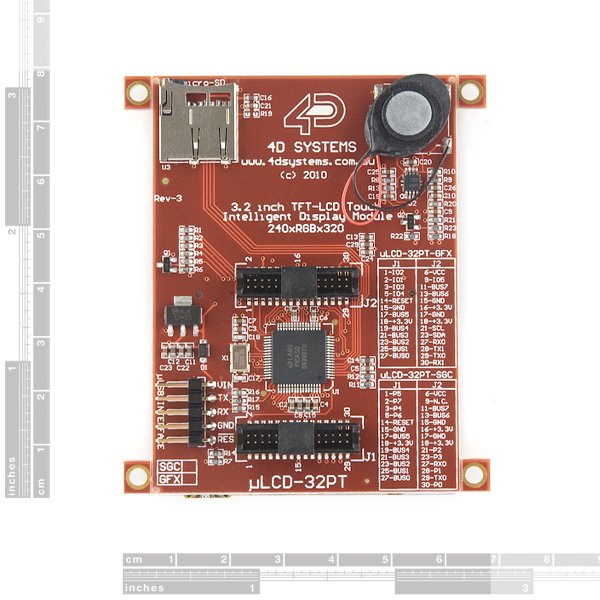 However, you must have the 4Dsystems serial connector for the display in order to download both 4DGL programs and the serial pmmc files. Is there any chance that SFE is going to make a breakout board or carry the break out board that 4d has for this display? Its a cool display and I love it! Any news on the breakout P1-EB for this display. It's the main reason I'm hesitating to pull the trigger. Probably not. This board is already pretty well done. Are these suitable for using with fingers for touch instead of the stylus used in the demo videos? Not sure if the diameter of the finger makes you have to use inordinately large button sizes or not. Anyone tried it? Yes you can use your finger, just not very accurate, just make the buttons a bit bigger and same with the touch zone for the buttons. Then it work great for fingers! I have found a connector that mates with the headers on the back. It's from Samtec. This part number is for a 4" cable with 28AWG wire. They have a few other different types of cables and connectors that will fit, but this part number is a good place to start. Is the 2 x 30 connector to mate with this available through SparkFun or another major source? Will you be carrying the ?USB-MB5 or ?USB-CE5 adapters from 4d. Otherwise can another type of USB (FT232) adapter be used? I just received my ?LCD-32PT, and I confirm, it works perfectly with the SFE 5V FTDI basic breakout board. It's not directly plug&play as the pinout is different, but once you've made a simple connector adapter, it's perfect ! I could only get it to talk to the LCD using the PmmC loaded tool using SparkFun's 5V FTDI (DEV-09716). In the FAT Controller, it gave me Autobaud Error and in the 4D Workshop IDE (when trying to load sample code), it gave me the device is not responding error. Errors happened in both SCG and GFX modes. Any ideas? Do I need to buy the 4D labs USB-Serial breakout boards? I combined this screen, a MP3 Development board, a bluetooth module for communication with my computer, and a small controller board into one project box to make an awesome base for my home automation system. My computer is hooked up to one board via bluetooth, which is hooked up to multiple other boards with the cheap little RF link transmitters and receivers. You can also use a PropPlug from Parallax to program it, that's what I use. But it does not supply power to the unit, so you have to have an external 5v line. I think you can use the SFE FTDI basic breakout 5V. The COM port is configurable in the "PmmC-Loader" software tool, and the "4DGL-Workshop IDE", meaning that those software are not using a specific driver, and thus an FT232 based adapter with DTR out should do the job. The LCD is 5V powered and the I/O are 5V tolerant. but, SFE is already carrying the ?USB-MB5, check : sku DEV-08531, and the ?USB-CE5 : sku BOB-08551 (out of stock). And... I'm glad the description above mentions that you can convert it to an SGC unit by downloading and applying different firmware. The 4D online catalog does not mention this - I found it mentioned in their support forum. The SGC firmware lets you control the display using commands from another processor over the serial interface. The GFX configuration lets you program the display itself in the 4DGL (C-like) language. I agonized over which one to buy, before I learned you could convert it into either config by choosing a firmware update. Yes, you are correct! They should make it more common knowledge that you can switch between the two. I bought one of these last week directly from 4D in Australia. The 4DGL language is so much like C that it was easy to learn. I had my app running in 2 days. One gotcha is that the shutdown requirements of the screen mandate you should implement an "OFF" button on the screen to turn the display off before you disconnect power - apparently just disconnecting power first can lead to a very premature death of the unit. Just to clarify, I spoke with 4D about whether there were necessary shutdown procedures that needed to be implemented when using this unit and they said no. They had never seen a display fail because of such a thing. They did recommend implementing shutting off the screen when it's not in active use by one's device/project/etc. This can be done via a command in 4DGL. So for those concerned about whether plugging/unplugging this display would cause it to fail, it is not a concern. language just to use a new (and very nice) display in some new project, although 4DGL seems to be easy. Well, no pain no gain, obviously. The whole thing feels like it's designed for OEM volume users. EVE is a proprietary ... virtual processor. Once again, not the open, familiar, hobbyist-friendly feel I was hoping for. Maybe Sparkfun, a reader (or myself, in my hypothetical spare time) could create an open version? Something like the PSP display+touchscreen with an ARM controller, using eLua or another open-source scripting language to allow control from a host system? Newbiew question. 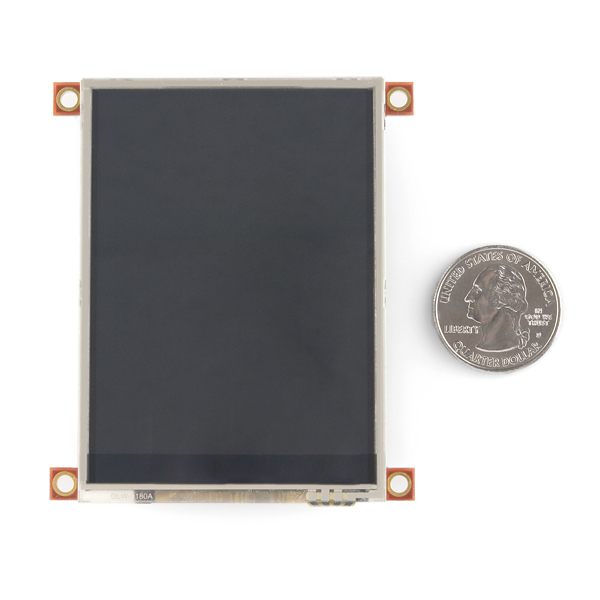 This LCD can be connected to ardio FIO/Duemilanove, to display outputs? Longer answer, not without quite a bit of programming. ...OR you could program it in 4DGL (similar to C) to make your own version of serial commands that are more user-friendly. I was under the impression that this unit should be easy to use = send commands via serial line and it does what you tell it to do :) The command set looks pretty easy from the pdf. Eh, yes and no. It depends on your level. I played with one for awhile and it didn't seem as simple as our basic graphic serial LCD, for example. If you've read the manual, you're well on your way to learning more about how it works. But it's certainly not like using a basic serial character LCD. It's also valid for Goldelox-based Î¼OLED screens.